Good day LDV readers! 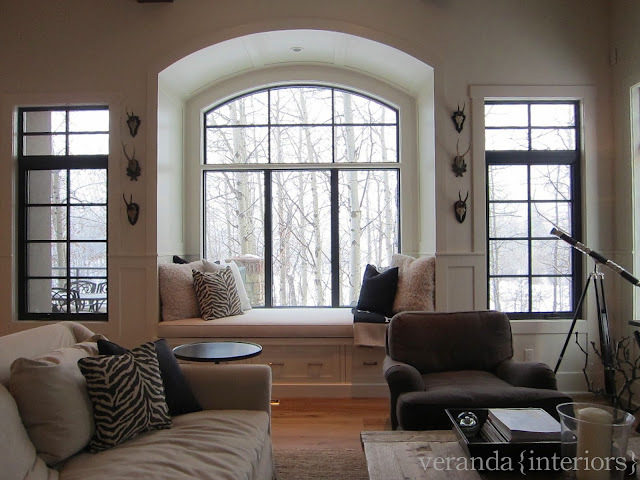 It is Melissa here from Veranda Interiors and I am very excited to share with you a glimpse of one of my favorite spots in our home. We are on a small acreage just outside of the city and completely surrounded by towering trees. The the spot I decided to share is where I unwind after long days, usually with my boys and a few great books to share. We also love to see what animals and tracks we can spot in the fresh snow down on the yard...we tend to get a lot of critters out here, from fox to moose, & this is a perfect space to scope them out. The built in day bed is used all the time, either my myself or the boys. It is also a great hiding space for all of their toys, there is a small Logo village tucked away in those drawers...which are perfect for quick clean ups! Since we have such an amazing view from every spot in our home I wanted to minimize window coverings but I still needed something going on. I decided to have the windows grills painted black to contrast and stand out from the white wood work throughout the home, it was the perfect combination as they balance so well to all of the doors in the home that are painted the same color. Gorgeous! I love the touches of animal inspiration with the little antlers and zebra print. LOVE IT! I'm always impressed by your designs, but I've not seen much of your own space! Mel, it's amazing. Right down to the Hermes throw. Melissa and her husband are such a talented couple. I could totally imagine relaxing on that daybed by the window with the snow falling. Heaven! 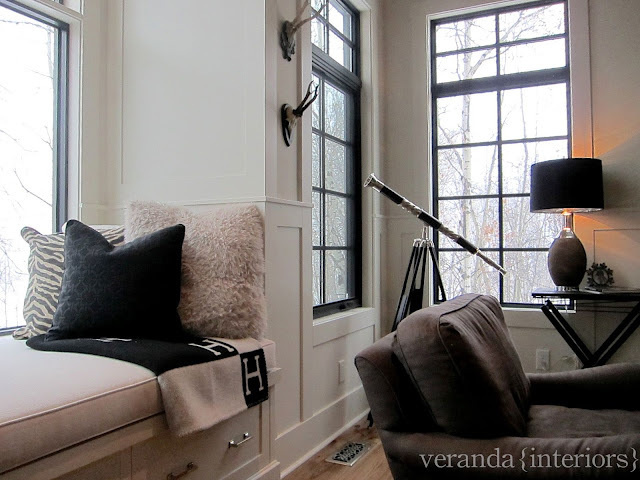 Wow a gorgeous space,I'm sure the rest of the house matches,can't keep my eyes off the Hermes blanket though! I simply adore Melissa's style, and looove this peek into her home! I adore Melissa's home having been privy to be included in one of her amazing dinner parties. The pictures don't do the house justice - simply stunning! Love her home! It's absolutely gorgeous!